Honda Cars Philippines, Inc. (HCPI), Honda’s automobile business unit in the Philippines, recently awarded the winners of “It’s The Most Wonderful Deal of the Year” campaign at Honda Cars Kalookan (HCKI) last February 3, 2017. Last October to December 2016, HCPI conducted “It’s The Most Wonderful Deal of the Year” campaign, offering low cash out and prizes for customers who inquired, test drove, reserved, and purchased a brand new Honda vehicle. This campaign gave customers a chance to win several prizes, such as GoPro Hero 5 Black, iPhone 7, Php100,000 cash rebate, and an All-New BR-V 1.5 S CVT as the grand prize. HCPI hosted an awarding event at HCKI for the formal turnover of the All-New BR-V 1.5 S CVT to the grand winner, along with the other winners of the campaign to personally handover their much awaited prizes. 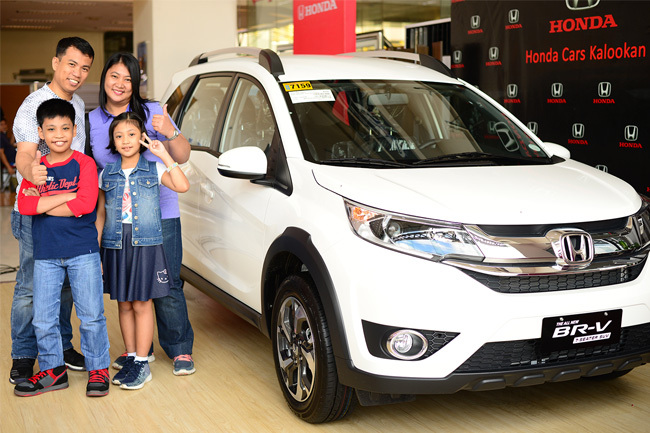 “I feel really blessed because before vehicle purchase, I was choosing between the City and the BR-V. We were eyeing the BR-V for the comfort of my family, but in the end, we chose to buy the Honda City. From there, we just hoped that we’ll win the promo, and bring home the BR-V. Fortunately, our prayers came true.” said Mr. Rhemus Maramba, the grand draw winner of the All-New BR-V 1.5 S CVT on his acceptance speech.